The translation for tiramisu is "carry me up", or "pick me up" and many who taste this ethereal dessert assume the unspoken continuation must surely be "to heaven." Tiramisu is a light composition of sponge cake or ladyfingers dipped in a COFFEE-MARSALA mixture, then layered with MASCARPONE (an ultrarich Italian cream cheese) and grated chocolate. The dessert is refrigerated for several hours before serving to allow the flavors to intermingle. Although tiramisu is sometimes referred to as an Italian TRIFLE, it's texture is much lighter than that dessert. Source: The Food Lover's Companion, 2nd edition, by Sharon Tyler Herbst. "This variation on the famous Italian Tiramisu dessert is one that intrigued me. I made a few changes and "velò" (voila), we now have Key Lime Tiramisu!! 1. Place 1 or 2 layers of plastic wrap in the bottom and up sides of a rectangular (2 quart) 8 x 11-inch (20cm x 28cm) glass baking dish (such as Pyrex), leaving about 3 to 4 inches of overhang on each end of dish so as to allow easy removal of dessert from dish to serving platter. Set prepared dish aside for later use in the recipe. Note: If you are not going to transfer tiramisu to a serving platter to serve but are going to serve it straight from dish, layering the dish with plastic wrap is not necessary. 2. Whip heavy whipping cream until thick. Keep chilled in refrigerator until ready to use. 3. Slice pound cake into 1/4-inch slices. Place slices on a plate until ready to use. 4. Brew 8 oz. of instant espresso or instant coffee. Place brewed espresso or instant coffee into a large shallow bowl (such as a large soup or pasta bowl. You will use this bowl with brewed espresso or coffee in it for dipping the slices of pound cake in later in the recipe). Set aside and let cool. 5. With electric mixer, blend softened cream cheese (or mascarpone cheese, if using) with Key Lime Curd Sauce (or Key Lime Curd, if using) until well blended. 6. Using a rubber spatula, fold chilled whipped cream into cream cheese mixture. 7. Dust botton of plastic wrap lined dish with sweetened cocoa powder. 8. Dip slices of pound cake in cooled espresso or coffee and arrange slices of pound cake on bottom of cocoa coated dish. 9. Place a layer of cream cheese mixture over slices of pound cake, spreading as evenly as possible. Sprinkle confectioners' sugar over cream cheese layer. Repeat layering the tiramisu (pound cake slices, cream cheese mixture, confectioners' sugar) until you have used all of the pound cake slices and cream cheese mixture. Dust the top of tiramisu with sweetened cocoa powder. 10. Place tiramisu, covered, in refrigerator until chilled, at least 2-4 hours or up to 1 day. 11. About 20 minutes before you are ready to serve the tiramisu, take out of refrigerator and remove it from the glass dish by lifting up plastic wrap at both ends of dish (gently removing tiramisu from plastic wrap with a very large cake spatula or cake lifter and placing on serving platter) and decoratively scatter chocolate curls or shavings over top. 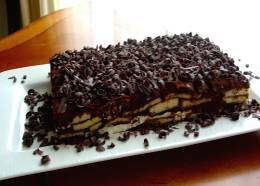 Alternately, if you decided to not line the dish with plastic wrap earlier, leave tiramisu in dish and decoratively scatter chocolate curls or shavings over top. 12. Slice tiramisu into squares and if desired, serve with whipped cream or additional Key Lime Curd Sauce (or Key Lime Curd). Key Lime Curd Sauce and Key Lime Curd may be purchased at some supermarkets and gourmet food stores. Key Lime Curd is a little easier to find then the Key Lime Curd Sauce, but either one will work for this recipe. Key Lime Curd Sauce may be purchased online at Rowena's Gifts - Creators and Producers of Gourmet Foods. Their web address is: http:// www.rowenas.com. You will need more coffee than specified in the recipe. It's very difficult to lift the pound cake layers once you soak them so I placed them first and then spooned coffee onto them. This was time consuming, but better than the pieces that made up my bottom layer. It tasted delicious.